Suppose you’re a curious visitor from another solar system hoping to get this Earth place all figured out without drawing undue attention to yourself. There are a lot of paths you can take, from shape-shifting to mind control to passing yourself off as just another trick-or-treater in an extra realistic costume. But maybe there’s no need to go through all of those elaborate motions. Maybe the secret to blending in with the Earthlings is as simple as finding the right pair of glasses. After all, some of Earth’s mightiest superheroes have been maintaining their cover with even flimsier disguises for decades. 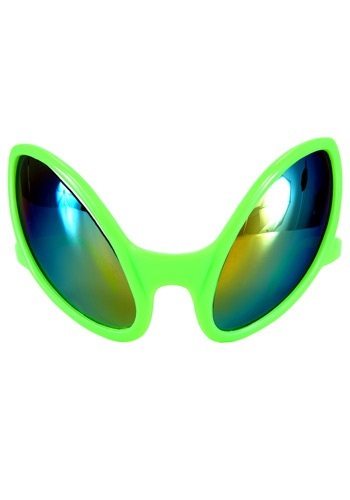 Of course, you can’t just stroll into the average eyeglass shop and ask for something suitable for space aliens. Fortunately, we have just the thing to suit your very specific eyewear needs. These striking green shades with slanted, oval eyes are just the size and shape to provide a swell disguise for any alien about town (they’re not UV protective, though, so you may not want to spend too much time in the sun). As an added bonus, they work just as well for Earth types searching for the perfect ‘80s new wave look!